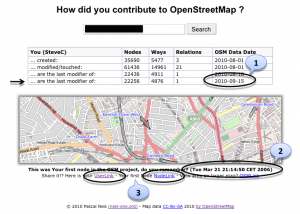 How did you contribute to OpenStreetMap ? -Update- : Neis One! Today, I made some small updates. The picture below shows the changes in the website. First (1) I imported the new planet data (Planet Dump 09/15/2010) that shows you on which OSM objects you are the most recent modifier. *NEW* is that the timestamp of your first contribution to OSM is displayed (see (2)! ), further a link to your first OSM Node is attached (3). I did some editing in OpenStreetMap for a section of Sierra Leone, but the “How did you contribute to OpenStreetMap?” website cannot find my username. I have no problem signing into OpenStreetMap using my username, but this website does not seem to be able to find it. I have even tried changing it as well. thx for your comment. What’s your OSM user name?